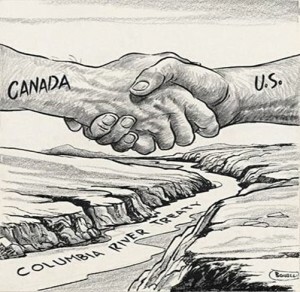 Since 1964, the Columbia River Treaty ratified by Canada and the United States has governed management of the Columbia River. The Treaty exclusively focused on flood control and power generation, ignoring the river’s fish, wildlife, and ecological requirements, as well as the interests of tribes and First Nations – salmon people – for whom the Columbia River Basin has been home from time immemorial. The Treaty, now over 50 years old, came toward the end of the Basin’s dam-building era, a chapter of the Basin’s history that transformed one of the world’s richest salmon rivers into an “organic machine”: stair-stepping dams and reservoirs that replaced millions upon millions of returning wild salmon with an integrated hydropower system. To be sure the dams brought benefits, but with a price: devastating damage to a living river and wrenching costs to people who depended on the river and returning salmon. The four dams built as the result of the Treaty, combined with coordinated management of mainstem and tributary dams, wiped out the natural spring and summer surge of flows down the Columbia. That flattening of the river’s hydrograph, in addition to the dams themselves, profoundly altered the Columbia River’s ecology. Within three decades of Treaty ratification, thirteen species of Columbia River salmon were listed as threatened or endangered under the Endangered Species Act. Turning large sections of the Columbia and its tributaries into a series of dammed reservoirs also resulted in routine violations of the Clean Water Act due to excessive temperatures and chemical pollutants. Modernizing the Treaty is a once-in-a-generation opportunity to restore the river’s damaged ecosystem for the people of the Columbia Basin and especially the First Nations and tribes. Giving voice to the voiceless – fish and wildlife, and generations unborn – underscores the need to address stewardship and justice principles in reforming river governance. Provides a framework to help people in the Northwest and British Columbia respond to the unprecedented impacts climate change is detonating in our waters and lives. 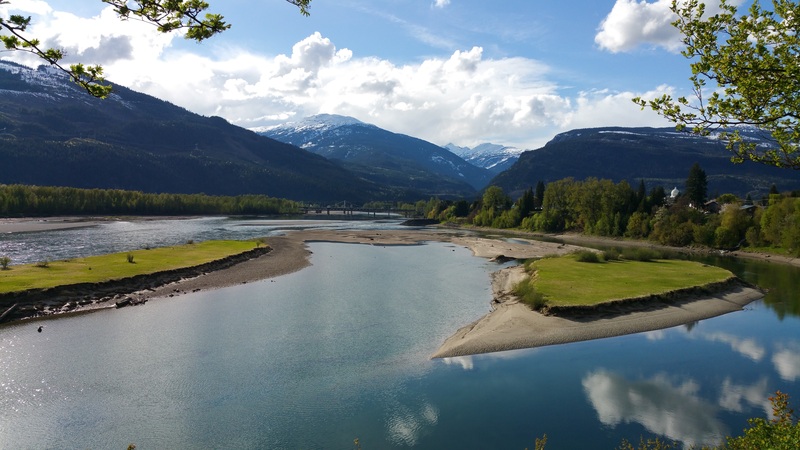 In November, 2013, CELP worked with organizations on both sides of the international border to convene the Columbia River Treaty Round Table in Nelson B.C.. The Treaty Round Table exists to promote a community of the Columbia by working together and networking across the international boundary. Participants in the Round Table include citizens, businesses, and other organizations in Canada and the United States who support modernizing the U.S. – Canada Columbia River Treaty, and who agree to a Statement of Principles. Since 2013, the Treaty Round Table has met monthly. Based on the Columbia River Pastoral Letter by the 12 Roman Catholic Bishops of the international watershed combined with tools used by hospital ethics committees, in May 2014 Gonzaga University hosted the first river ethics conference “Righting Historic Wrongs” on the past and future of the Columbia Basin. 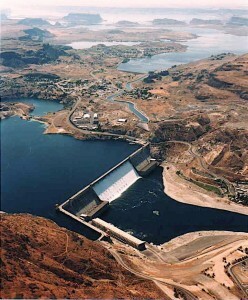 The conference provided a forum for religious and indigenous leaders, scientists, and conservationists to discuss the impact of dams – acknowledging benefits while focusing on the wrenching damage and remedies through modernizing the Columbia River Treaty. Subsequent “One River – Ethics Matter” conferences have been held in Portland, Boise, and Revelstoke. The fifth conference will be held in Montana in 2018. Will changing an international treaty be easy? No. But this is a once-in-a-generation opportunity to change the future of the Columbia River.